مادران پارک لاله ایران: جمهوری اسلامی در منجلاب بی‌عدالتی خود فرو خواهد رفت! مقالات » جمهوری اسلامی در منجلاب بی‌عدالتی خود فرو خواهد رفت! The Islamic Republic will sink in its own cesspool of injustice. The authorities of the Islamic Republic of Iran think that if they harass the families of the executed and disappeared, they can bar our path to justice. Such a delusion! They fail to realize that oppression cannot endure forever. One day the truth about what they have inflicted on us will be revealed, and the oppressors will be held accountable and punished for what they have done. It is true that since the beginning, by terrifying and terrorizing the Families, the Iranian regime has forced some to retreat, or live in isolation. But this situation cannot continue forever. Every day we witness not only the Families’ calls for truth and justice, but we also hear the voices of past and present Iranian regime members confirming evidence that the state has committed heinous crimes. On Friday, 16th of September, I was heading to Ireland. The trip was supposed to calm me and cheer me up, as I have had a very hard time recently; particularly after losing my beloved mother in January. I have not got used to her absence yet. I wanted to spend some quality time with my daughter in Dublin for a few months, away from all the tensions and pressures in Iran. My daughter is a university professor, so I would have the days free to myself. I had planned to explore the city, visit its greenery and landmarks, and to communicate with people in the city to calm and cheer myself up, and also to improve my English. I also wanted to visit the libraries of the universities, and to familiarize myself with the academic and cultural environments of Ireland. On evenings and weekends, my daughter and I could enjoy each other's company, relax, and rejuvenate. But unfortunately, none of this will happen. The Iranian regime’s security agents at Tehran airport barred me from exiting the country and deprived us of the simplest right: spending time with family. A similar story happened before in 2009, when I was trying to visit my other daughter who was living in Italy. Just like in 2009, again the security agents at the airport passport control exit-stamped my passport, suggesting that I was free to leave the country, only to later stop me from getting on the plane. Perhaps they had hoped they would find me in a quiet corner, where they could take me away without anyone noticing. However, as with my attempt to visit Italy in 2009, they had to call my name several times from the loudspeakers. This time, they called me more than twenty times. Finally, they came for me at the boarding gate. When I asked why this was happening, they said, “We are just agents and do not know anything.” So in order to make them and the surrounding people in the airport aware of how the Islamic Republic of Iran has oppressed me and my family, I began to call out the injustices that have been done to us. Everyone’s attention was drawn to me; the other passengers looked alarmed, and started whispering to each other with concern. A few passengers even came toward me to show their support and solidarity. The air was filled with tension, and to control this, the agents had to play one of the popular anthem of the people, “Ey Iran Ey Marz-e Por Gohar” (O Iran, the land of gems abound) from the loudspeakers. They then seized my passport and took me to a room where I was given a letter. The letter asked me to go to the revolutionary court at the Evin Prison for follow-up. It was that easy for them. In a matter of minutes, they crushed the plans that had taken me months to organize, and confiscated my passport. 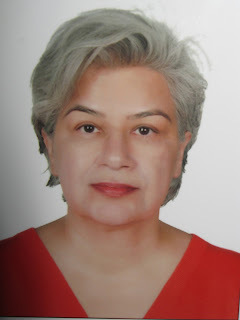 They gave me a letter ostensibly to follow up on my passport, but in reality, the letter was to make me appear at Evin Prison’s revolutionary court, so they could interrogate me. It is possible that, during the interrogation, they might arrest me, or threaten me with a heavier sentence, which I would strongly protest. I am aware that resisting injustice and oppression has a price, and I am prepared for it. In February 2013, when I was summoned to Evin Prison to serve my outstanding sentence, I packed my suitcase and went to the Sentence Enforcement Unit, but they told me to go back home. They gave me no further information on my sentence or on what I could expect next, leaving me in suspense. So my prison suitcase is still packed and ready for any moment when they may wish to call me again. I have now emptied the suitcase I packed for Ireland, and I will post the gifts I was taking to my daughter. I will resume my tension-filled, stifling life in Iran, but I will not bend to the wishes of an oppressive system that does not adhere to any moral standard, or even follow its own rules. I will not pledge to stop my efforts to reach justice. Once again, they have confiscated my passport. They already did this to me in 2009, and I was not allowed to leave for five years. But what was the result? Could they silence me or stop my activities? Never! The Iranian regime's security organization must have known by now that threats and rights violations will not stop us from pursuing our goals, but will only make us more determined to seek truth and justice. If the Iranian regime knew even a tiny bit about modern governing, they would allow for small elements of democracy to enter public life. Even if it was for the sake of saving themselves and not improving people’s lives! But instead, they continually crank up the pressure valve on Iranian citizens, and harass and attack the Families of the executed and disappeared. If they had learned from history, they would have known this mode of governing cannot continue, because one day the downtrodden will cease to endure continual oppression and will rise up, and on that day, the oppressive power will no longer be able to survive.